Click for a full-size image. 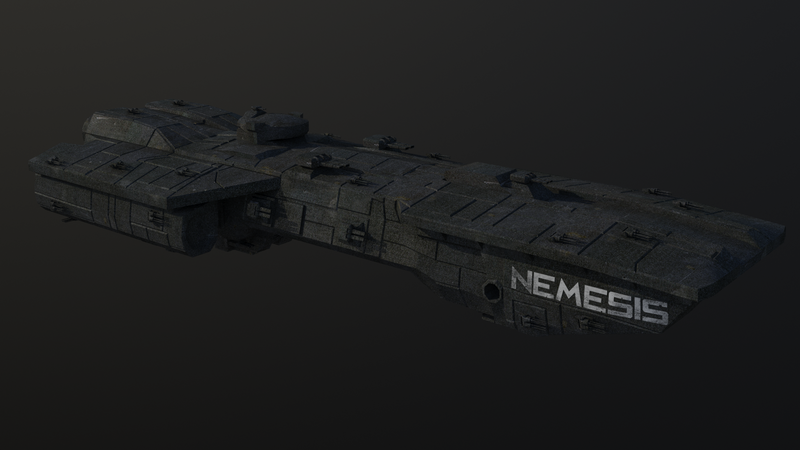 The Nemesis battlecarrier is the base of operations for the REKT: Beyond the Edge campaign. It can be upgraded/repaired over the course of the campaign; further details on this at Nemesis Status. A roster of all crew members is available at Nemesis Roster. The Nemesis battlecarrier is a standard spacefaring assault support vessel with a maximum crew count numbering in the lower thousands. It has been around since nearly the founding of Tartarus Inc., and as such is one of Tartarus's oldest ships. Its history is long and unusually colorful; Tartarus has a fondness for sending it on advanced, secretive missions, leading it to be rather well-known, while at the same time shrouded in myths and urban legends. While it is capable of carrying a number of REKT inmates and their associated CASKETs, its primary assault force tends to be veterans of the REKT program who have already completed their tenth mission. It is not intended to be a training vessel. It's worth noting that the Nemesis is absolutely not designed to land on a planet's surface, atmosphere or otherwise. The ship's decks are arranged horizontally like a sailing vessel and less like a skyscraper; orienting itself vertically would permit it to land on its engines, but its engines would be destroyed by the process (and likely the whole of the ship as well, which would crumble under the weight of itself). It could feasibly land horizontally, which it did; however, it is then incapable (even in pristine condition) of generating enough thrust to re-orient itself vertically for subsequent takeoff. The Nemesis survived the crash-landing on Nanyej by positioning itself horizontally and using the lower hull both as a heat shield and a method of producing drag to slow itself down, before landing horizontally and sliding to a stop. Many decks were further damaged by this, and before the attempt was decided upon, it was uncertain whether it would even survive the attempt in whole or in part. The alternative was to let the Hiltorel blast it to little bits… so naturally, those in command chose the option with a slightly higher chance of survival. The Nemesis is 630m long, and 240m wide. The mess hall is located in the bow of the ship. While the front of the Nemesis sustained quite heavy damage during its crash-landing on Nanyej, the mess hall remained fairly intact… disregarding the tables being ripped from the floor. Restoring the mess hall is currently one of the lowest priorities. Located in a well-armored protrusion above the ship's midsection, near the hangar, the armory nevertheless sustained severe damage during the Battle of Nanyej. Much of its stock was lost during a hull breach; many further supplies will require the work of engineers to produce. If repaired and properly maintained, however, it could be as good as it once was, with cutting-edge equipment available for the Nemesis's fighter pilots. For security reasons, the armory is off limits to any civilians outside of engineering. Unlike the Tartarus's luxurious (by comparison) quarters, the Nemesis boasts more spartan-esque dormitories for its large crew. Unfortunately the lower decks were ripped away during the crash-landing, leaving a shortage of bedding. While this could potentially be repaired, it is fairly low on the list of priorities. The multi-deck infirmary, located near the hangar and engineering, was one of the worst-hit areas during the crashland. At the moment its status is almost non-functional. Repairing and restoring any degree of functionality is one of the Nemesis's top current priorities, as a sizable portion of the surviving crew are injured, many of them severely. Until the engineers finish their repairs, the casualty count will no doubt continue to climb. The Nemesis sports a spacious central hangar, connected to the outside with a launch tube out the bow. It's capable of holding a few dozen CASKET-sized fighters, or several corvettes. The Hangar is located in close proximity to Engineering, the infirmary, and the armory. In addition, the Nemesis's "battle bridge" is located directly above the hangar, and in fact extends into it slightly, providing those on the battle bridge a bird's eye view of all proceedings. Outside of battle, this normally functions as a hangar traffic control center. The bridge is located in a protrusion on the upper hull, above Engineering and behind the hangars. A curious note on the bridge is that it in fact functions as an "Escape Bridge"; in lieu of the infamous "escape pods" of the early 3rd Millennium, the Nemesis's bridge is in fact capable of decoupling from the Nemesis itself and flying fair distances on its own. In fact, it is quite warp-capable, although it can only manage speeds of up to Warp 10. Outside of combat, the bridge offers an excellent visual vantage point of the surrounding area, sporting large windows of thick, transparent metal alloys. This was, of course, before the extensive damage it received during the Battle of Nanyej, rendering it almost inoperable. In fact, the Hiltorel fleet made this a priority target, perhaps in the mistaken belief that they were "cutting off the head of the serpent", so to speak. The battle bridge is located directly above the hangar, and in fact extends into it slightly, providing those on the battle bridge a bird's eye view of all proceedings. Outside of battle, this normally functions as a hangar traffic control center, but in battle it offers a central control area for the entire ship, keeping all essential personnel as safe as possible during an assault. Several floors tall and armored with several layers of protection, it is practically impenetrable except under sustained, direct fire - or spinally-mounted weaponry. It suffered the least damage of all areas during the Battle of Nanyej - that is to say, none. While Tartarus itself controls the bulk of the company's research, smaller ships like the Nemesis still operate small research divisions. These operate as rapid-response teams to artifacts, devices and technology that are expected to decay rapidly. It is not intended to act as a full research division, but rather as a satellite/supplement to Tartarus's core labs. The Nemesis's research labs are located somewhat toward the bow of the ship, near the armory and in close proximity to the hangars. They sustained only minor to moderate damage in the Battle of Nanyej and are still in usable condition, although many of the researchers themselves weren't as lucky. For security reasons, the labs are off limits to most crew members besides the resident scientists. The Nemesis is fairly unique in possessing a set of high-grade, cutting edge VR combat simulation chambers. While there are only six chambers, and each can only seat five, it is still considered incredibly advanced for the day. These were only recently installed - four years prior to crash-landing on Nanyej. The battle and landing dealt some damage to the VR simulators and rendered them inoperable, but it's expected that the engineers can get them back online after a brief inspection and replacing of several key conduits. The VR chambers are located in the bow of the Nemesis, above the mess hall. Officially a room for holding conferences with diplomats and visitors, the Conference Chamber is set to be repurposed at need as a briefing room. This room unfortunately suffered severe damage during the Battle of Nanyej; all the potted plants were toppled and a number of pictures, most notably the one of SCAMPS, were dislodged from the walls and are in need of critical repairs. The long-range comm center served as the primary method of communication for the Nemesis, diplomatic and otherwise. It possessed its own unique crew trained in a number of different languages, cultures, and customs; a number of engineers resided here as well. The Comm Center unfortunately took severe damage during the Battle of Nanyej, and then completely obliterated upon landing on Nanyej's surface; this was unavoidable, seeing as the comm center was located on the absolute underside of the vessel. There is nothing left of the comm centers at this point, and there are currently no plans to rebuild, although long-range comms would certainly be beneficial. Engineering is an expansive area toward the back of the ship that covers many different "zones" of importance. It has easy access to the rear guns, the primary engines, SCAMPS, the main reactor, the shield generators, and of course the Hangar. Top engineers have their own special set of dormitories that permits them to be at their post in an instant if duty calls. All crew members have access to Engineering except during combat, when engineers need to be at their peak capacity and are allowed as few distractions as possible. Nestled in the heart of Engineering, Nemesis's primary reactor takes up a fairly large amount of space. It actually consists of a number of "cores" that can be "spun up" at will to meet the expected demands of the vessel at the price of increased heat output and fuel consumption. The reactor is a form of antimatter/fusion power generation, enhanced with anomalous materials. The exact functioning of the Nemesis's model is classified and known only to the highest level engineers - and SCAMPS as well, of course. If the need arises, there are schematics available (in print) that explain the reactor's inner workings; however, they can only be accessed by the Head of Engineering or a superior officer. Coupled alongside the reactor are the ship's gravitational control units. These provide gravity to the ship and nullify the acceleration produced by the engines. Civilians are permitted to access the Reactor only after being properly screened for contraband that might be used to damage them. The Nemesis sports a quad set of engines, naturally located at the rear of the vessel. Prior to the battle of Nanyej, all four primary engines were capable of high-power acceleration and warp travel. However, they received severe damage in combat from the Hiltorel fleet and the warp systems are not only offline, but completely obliterated; this reinforces SCAMPS's opinion that the Hiltorel intended to disable the ship without destroying it, perhaps for boarding and venting at a later date. Fortunately for the Nemesis, it retained a degree of control to its traditional antimatter thruster systems sufficient to bring it into Nanyej's atmosphere, even under heavy fire, but not without the loss of life. Many engineers perished due to critical decompression of Engineering and the primary engines. A project is currently underway to restore some degree of warp capability; unfortunately, there is a very limited supply of uncontaminated Veloxium, the anomalous material necessary for warp travel. Procuring an adequate supply is considered a top priority. The Nemesis has two large nacelles, located to either side of engineering. These serve a number of purposes. For one, the rear engines can both steer and provide additional acceleration to the warship; this could be seen as their primary purpose, as they are not capable of warp travel. The nacelles have high-swivel engines mounted to the front as well, which serve primarily to steer/rotate the vessel through the use of manipulable projected particle shielding. If necessary, they can also be used to provide some degree of reverse acceleration. Finally, each nacelle contains large storage areas, primarily containing engineering equipment; this is managed completely by automated logistics machinery and robotics. An engineer makes a request of SCAMPS, SCAMPS relays the data to the logistics bots, and they retrieve the item(s). As logistic bots are typically the only ones that visit these areas, they are considered off-limits to crew members so as to retain an accurate record of the contents. The starboard nacelle was ripped away during re-entry, and was reported to land a fair distance from the Nemesis; damage to this nacelle has not been analyzed, and recovery seems difficult if infeasible. After the crash, crew members inspected the remaining nacelle for signs of damage and came across a number of individuals preserved in cryostasis. One of these were matched to 80-year-old records of a notorious criminal; it is assumed that most, if not all of these individuals were violent criminals. A program is currently underway to revive some of them and put them to use, as the Nemesis is severely understaffed as it is, having sustained heavy casualties.